Alfa Romeos with the wrong fuel is not the most common job we have by far but we are seing more of them. Alfa does some great little diesels and I even had one myself (156) a while back. The most common alfa we deal with by far would be the 159 followed by the Mito. 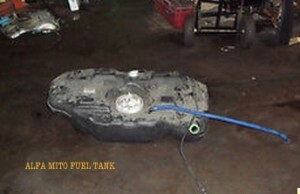 This is the Mito tank, it is quite small for a diesel tank but then again the mito isn’t a heavy drinker. these tanks are emptied of the wrong fuel with the usual suction tool. 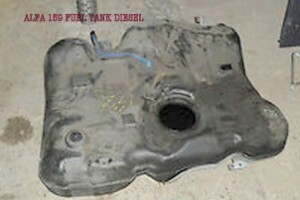 And the 159 fuel tank, again being a single cell tank we remove the wrong fuel from these by using our suction system. Posting pictures of the fuel tanks here is slightly misleading, I never take a fuel tank off when doing a fuel drain, but whenever I am round the car breakers I have a look at the tanks on the shelf to get an idea of how to get as much fuel out as possible when doing drain as the lowest point of the tank is not always visible when it is fitted in a car.